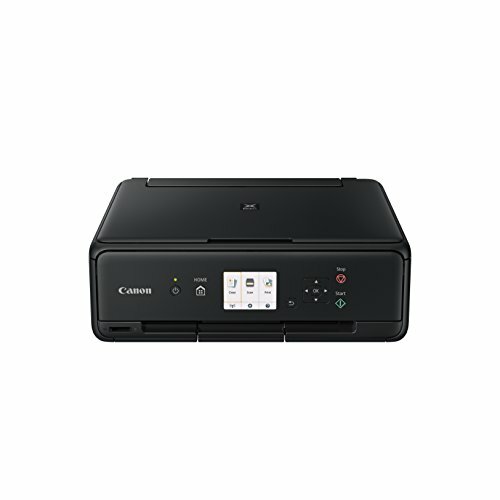 THE PIXMA TS5050 is another of Canon’s new additions to its home color MFP range. 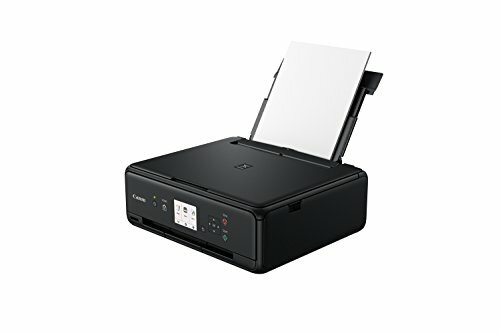 The curved edges and attractive squat design make it look more like fancy audio-visual kit than something as mundane as a multifunction peripheral, but an MFP it is: it can print, scan and copy, and you can connect to and share it across your home Wi-Fi network. 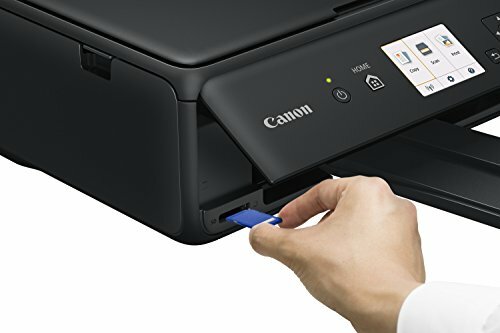 It’s also great to see that Canon has made the TS5050 less fiddly to use than previous generations: the combination of a color 3in display and redesigned controls are a definite improvement, and Canon has finally ditched its confusing mix of separate selection buttons and direction rocker. Now you just get simple cursor keys with a button in the center to confirm your choices, and the new menu is much easier to navigate as a result. 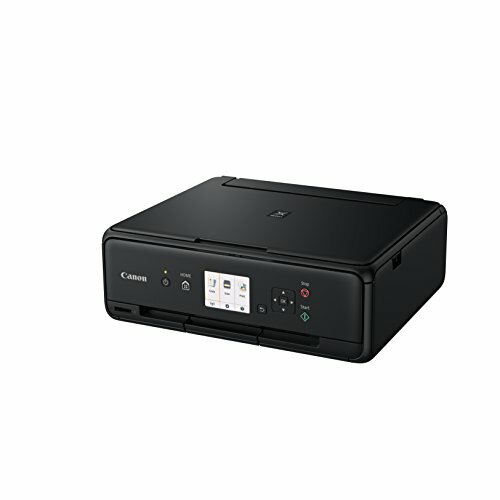 The Pixma range is purpose-built for creative home use, so the TS5050 has an SD card slot which lets you print photos directly from your memory card. 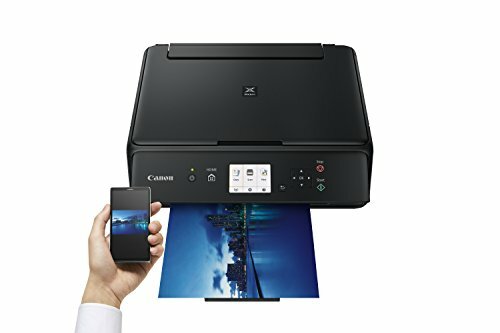 Alternatively, you can use Canon’s Android or iOS apps to print wirelessly from a tablet or phone. The TS5050 has a conventional 100-sheet rear paper feed and front output tray. We had some trouble with the feed slot cover, which you have to close manually after restocking with paper. 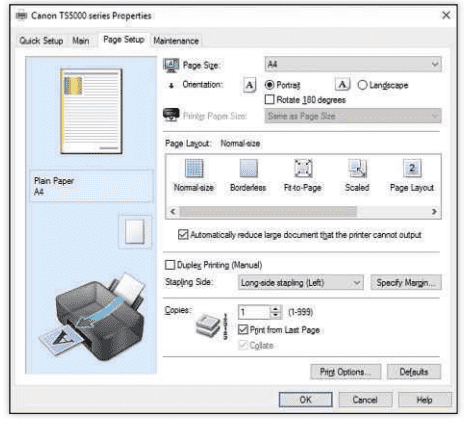 As on the Pixma TS8050, it’s easy to forget, and sometimes needed wiggling before the printer would detect it. Another minor niggle is the lack of automatic double-sided (duplex) printing – at this price we’d expect that as standard. Still, it’s good to see that Canon has employed its five-ink system, which uses both a pigment-based black for bold text on plain paper, and a dye black for better contrast in photos. 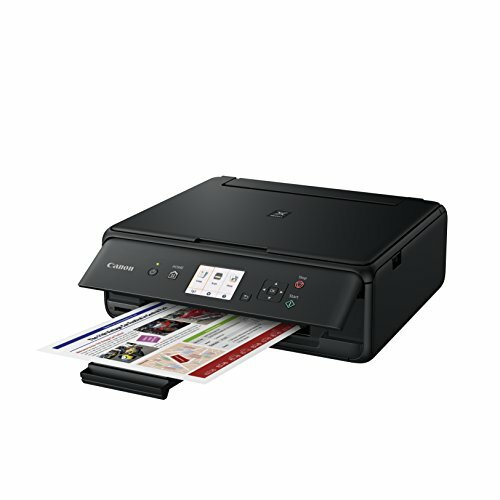 This MFP is an adequate performer, managing to deliver black text at 12.3 pages per minute (ppm) in our 25-page test. Switching to draft mode lightened the result, saving ink, but there was no other noticeable reduction in quality and no improvement in speed. The TS5050 produced color graphics at a fairly rapid 3.7ppm, reaching 4.8ppm in draft mode for only a slight loss of quality. At the highest possible detail, it took almost seven minutes to print two 10x8in photos and nearly 11 minutes to complete six borderless 6x4in prints. Connected via USB, scan times are quite quick at anything up to 1,200 dots per inch (dpi); capturing a postcard photo at this depth took a minute and a half. Photocopying was slightly slower than we’d expect, though, with a single A4 copy needing 20 seconds in black only and 21 seconds in color. 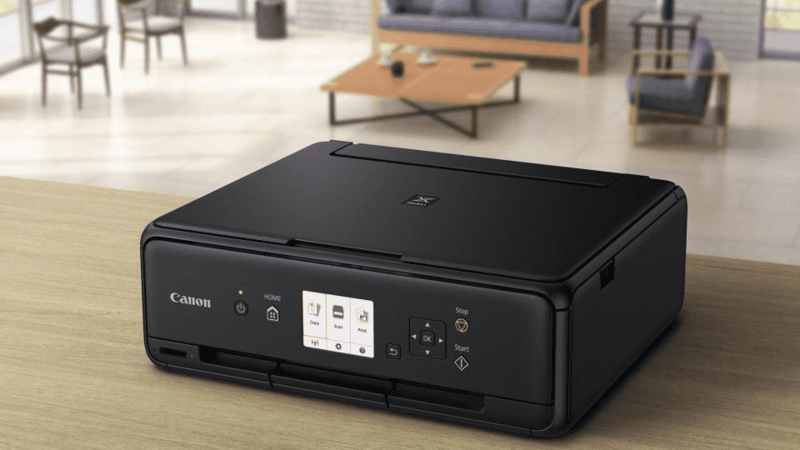 Canon usually fits good scanners to its MFPs, and results from the TS5050 were very good, showing a particularly sharp focus and a high dynamic range that preserved both very light and very dark shade detail. Both color and mono copies were a shade too dark for our liking by default, but they’d do for most purposes. Regardless of the source, print quality is almost uniformly excellent. Text was dark and reasonably crisp, while photos were sharp and detailed, albeit with a slightly warm tone that might not please perfectionists – those looking for perfect prints may need to do a little tweaking in Photoshop to get things looking just so. 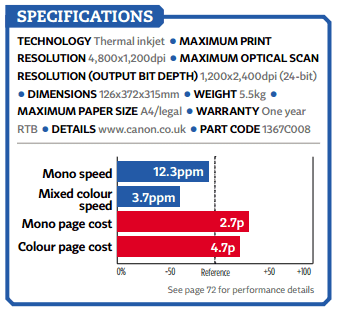 Canon’s two-black-ink setup means that, at 2.7p per page, the black component of our running cost calculations is on the high side. In practice, the dye black ink is barely used for plain paper work – Canon estimates it will last for around 4,000 pages. The overall cost figure of 7.4p per page is a touch high, but not excruciatingly so. With good looks, great results and often brilliant performance, the Pixma TS5050 is a great MFP for the home. 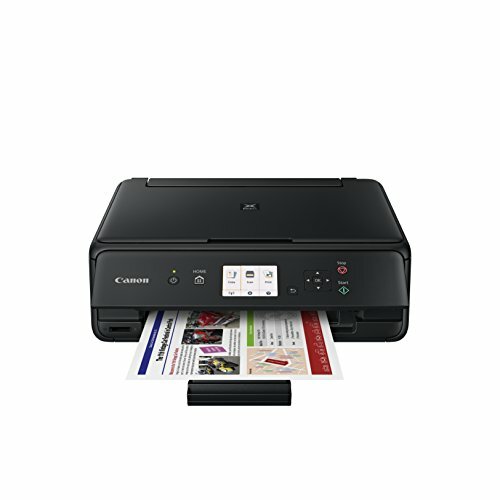 If you don’t mind paying a premium for it, and can forgive the lack of duplex printing, then this is a talented MFP that’s worthy of a place on your desk.